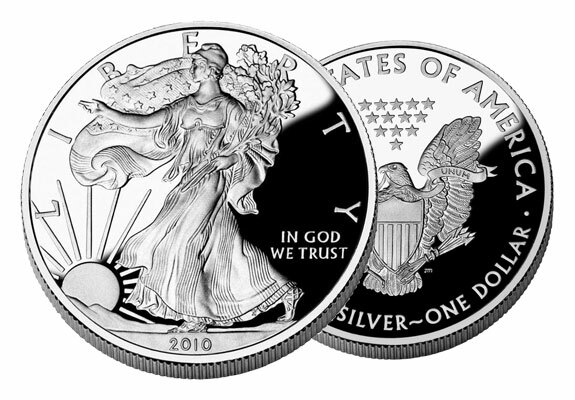 First issued in 1986, American Silver Eagle Coins are struck solely in 1 troy oz. denominations. Having the nominal face value of one dollar, American Silver Eagle Coins are assured to possess one troy ounce of 99.9% pure silver. The contents and weight of the American Silver Eagle are certified by the United States Mint and officially authorized by Congress. American Silver Eagle Coins have been produced at three different mints: the Philadelphia mint (carrying a “P” mintmark), the San Francisco mint (bearing an “S”), and more recently, the West Point mint (having a “W” on the reverse side of the coin). Obverse: Characterized by Adolph A. Weinman’s classic “Walking Liberty” design, which during the time from 1919-1947 had originally been used on the United States half-dollar coin. Silver or otherwise, Weinman’s iconic design has been a public and collector favorite and one of the most truly admired designs on any U.S. bullion. Reverse: A John Mercanti design featuring a heraldic eagle. The American Silver Eagle Coin series has rapidly become a favorite of both bullion investors and coin collectors, making it easy to purchase and liquidate as needed. To add American Silver Eagle Coins to your existing IRA, former 401(k), or Precious Metals IRA, or make a cash purchase for direct delivery, contact American Bullion toll free at 1-800-326-9598 to speak with a specialist.